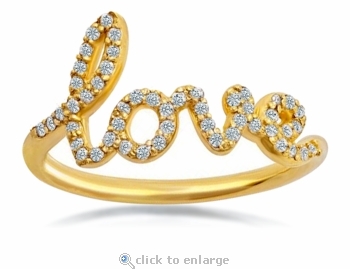 Express your passion for the emotion that rules the world with our diamond look cubic zirconia pave set Love Ring. 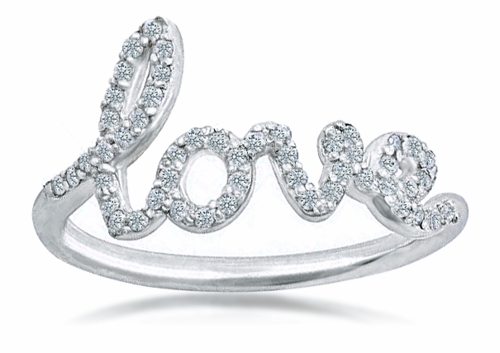 This cute and dainty band shouts out the word love, the feeling and emotion that yields so much power. It's spelled out in cursive script letters, each encrusted with hand set brilliance and sparkle. Makes for a great gift for a loved one or a valentine. Compare this to the Tiffany and Company Paloma Picasso Love ring and you can get the look while saving a lot of money. When you wear our statement Love Ring as a fun and whimsical piece, be ready for lots of oohs and ahhs and a bunch of compliments that will generate conversation about this unique band that announces to the world how strong you feel about love. The widest part of the ring measures just under half an inch tall with a total carat weight just under .75 carats of the finest diamond quality Russian formula cubic zirconia stones. You can order this Love Ring in 14k yellow gold and 14k white gold as well as 18k gold or precious platinum. See the pull down menu below for all the options available. For further assistance, please contact us directly at 1-866-942-6663 or visit us via live chat and speak with a knowledgeable representative.